Here you can also see the DIY busboard kit I got from clicks & clock (and a custom DIY panel for Toppobrillo's Buchla 281 clone). 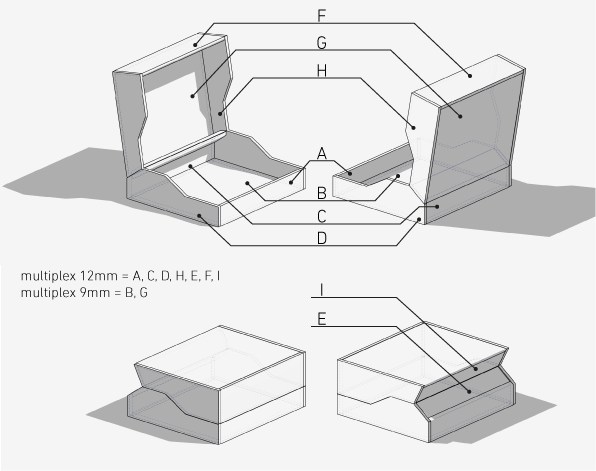 In this post I list all the wood parts needed for the foldcase. I decided to use birch multiplex because it is lightweight, stable, easy to work with and doesn't cost too much. On top of that birch multiplex stays in shape with different temperatures and humidity levels better than massive wood of other trees (there will be a difference in temperature between the inside and the outside when the synthesizer is running for hours). I decided to use two material thicknesses: 12mm for most parts and 9mm for rear and front plates to save weight. All length units are in milimeters. See the table below for the raw dimensions of the wood. 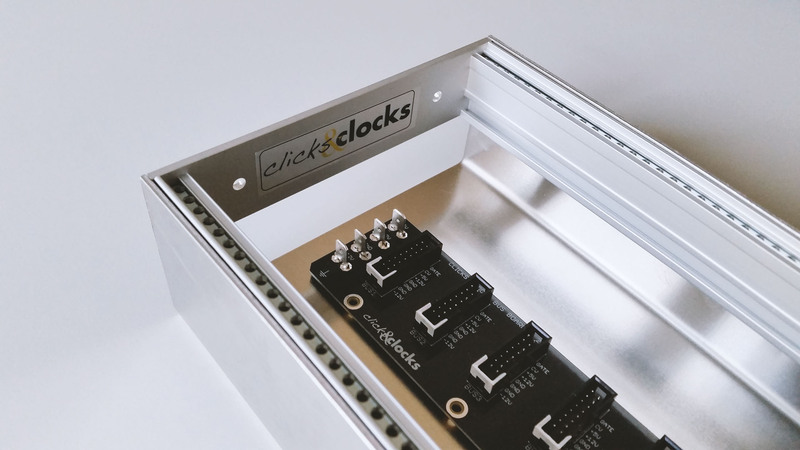 The trend to create low-space-versions of existing open hardware eurorack modules is going on: there is a μBraids, a μClouds etc. It doesn't make sense all the time to force in a existing module's functionality in less HP tho. With the μBraids it makes sense, with the μClouds not so much, because functionality and usability suffers (you will find yourself twidling live more often with a effect module like Clouds and less often with a oscillator like Braids. The open hardware module with the interesting title Ornament & Crime by mxmxmx is one of the modules where (aside from easier soldering) it doesn't make any sense to use that much panel space. That is why jakplugg made a micro version of it called μO_C. I decided to build some of these, but didn't find suitable Gerbers for the panel – so I decided to roll my own. For anybody interested, I still have 5 in Stock. Short recording of a zener-based white noise module with Clockable Sample and Hold. On every trigger input a new value is sampled from the flat white noise source and output as a steady DC value till the next trigger arrives. This is the design I ended up with – I decided to base it on hinges that connect the single rows with 84HP each equaling to 336 usable HP in total. I made a model in blender with an armature and constraints to find out which angles are needed. Click the fullscreen button, if it is too small for you. In the top of the hood a stripe of LEDs will be placed for lighting. Color and intensity might even be voltage controlled? who knows? In online discussions circling around the broad topic of music hardware one burning question seems to arise commonly: how much is a piece of technical/musical equipment allowed to cost, before it gets branded with the haunting label "overprized"? This question is more complicated than it seems at first glance, because quality, availability and so on plays also into this. A old Roland drum machine may be worthless if you count the value of its components, it may be overprized for the complexity of its circuit and so on – objectively it would never be worth the money, if there wasn't some sort of vintage hype around it. Yet nobody seems to complain about the pricy vintage gear. Why?